Have we learnt anything from the first 8 weeks of a 1:1 iPad trial? The comments below are based on observation and conversation during recent feedback sessions. They serve to inform our training programme as we seek to enhance learning with the iPad. Students have impressed staff with their ability to use the device. If they are faced with an issue they will contact as many people as possible to solve it (usually through Edmodo or email). Of course, there have been issues with passwords and excuses made because of the technology, but these have been few and far between. It highlights the need to ensure students understand how to use the device/apps and that they should be a focus for training and support. With a variety of staff volunteering to conduct the trial we have been able to gauge opinion from different perspectives. A common theme centres around the need to invest time early to understand how the iPad can be used to enhance learning. Teachers who have ‘played’ with apps and asked lots of questions are now reaping the rewards with ease of use and lessons showing progress and varied learning opportunities. Those teachers who haven’t afforded as much time are on a slower learning curve. 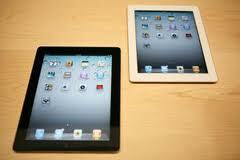 The iPad then seems to be a concern as the students are so adept with the interface. Personally I believe we are learning alongside the students, but this is a departure from the norm for some. The iPad has been described as a ‘game changer’ for education and it has certainly made an impact inside and outside the classroom. This can be very difficult for staff to embrace and the ‘change’ must be properly supported. As previously suggested (blog), constant support is required to help the iPad become part of a teacher’s toolkit. I would therefore add to the lessons above – collaborate and share at every opportunity. That’s where twitter comes in . . Interesting to hear about the development ‘in progress’. Look forward to how it progresses. I note your comments on students being keen to find new ways of demonstrating their knowledge – that’s something I hope to see too as we begin to trial the introduction. Great post! We are following a similar journey with 5 teachers and 25 shared iPads. We have had them since the end of February and the feedback I am getting from both students and staff is very positive. We are running a 1:1 trial at the moment: 1 class uses the iPads 24/7 for a week, the following week the next class and so on, over 4 weeks. Are you a Mac or PC school? Thank you. We are a PC school which has made things a little trickier unfortunately. I’ve been fortunate to have used the iPad in my ICT classes for nearly a year… Unfortunately there has been (and still exists) barriers to their effective use within our environment. Access to our network / shared internet access being the biggest. Apple tv that does not work because adapters not purchased as part of the original order and I’m still waiting! These are just a few of the technical or financial barriers that exsists. Thank you for your comments. I’ve tried to document our troubles throughout this blog so it might be worth trying a few of the early posts. Happy to answer any questions you may have. Thank you. It is definitely a case of us all learning together. Really enjoying it. Its good to hear all the different remarks from teachers. We all attempt to stay ahead of our students with good presentations. I’m finding that it takes a lot of practice to get the hang of what to do next.